An-Ting Chung- sound and visual artist, record producer, recording & mixing engineer, has been creating sound exhibitions for the past 10 years beginning with her master's degree thesis exhibition at Rhode Island School of Design in 1997 through her 2000 and 2007 New York exhibitions sponsored by the National Culture and Arts Foundation in Taiwan. When not creating 'sound sculptures' as she likes to call them, she is kept busy as an in-demand sound professional. These past 7 years her work has spanned all genres of music: classical, jazz, pop, choral and rock. She has been prolific in designing sound for live musical events as well as recording live performances which have included Eric Lewis, the premiere pianist for Jazz at Lincoln Center; Roy Hargrove, widely considered to be one of the best trumpeters in the nation; Lance Horne, a renowned composer, performer and Juilliard instructor; and roots-and-Americana musician Greg Garing. She has also worked with the noted actress Amy Irving. 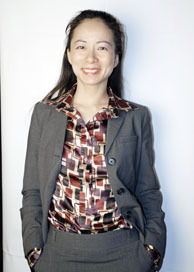 Additionally, Ms. Chung designed the sound for the Off Broadway productions of Vivre and A Touch Of Vegas. This year she digitally re-mixed and re-mastered live recordings of James Brown, Robert Gordon and Hank Williams. Currently, Ms. Chung is co-producing the first album for Night Rats, an up and coming New York based rock group. In January 2008, Ms. Chung will begin recording the entire score and sound track for two feature films, Anybody Can Be A Star, and Beauty Is Woman, both produced by EDP Ltd.
Ms Chung has an ongoing collaboration on film, video, and sound works with the widely acclaimed Shen Wei Dance Arts Company, who have performed at the Lincoln Center Festival and the Kennedy Center, and who will be responsible for the choreography of the opening ceremonies at the 2008 Olympics in Beijing. She was also the sound editor for Shen Wei's choreography for the piece Re-Part 2, which was performed by Les Grands Ballets Canadiens de Montréal in 2007.